Don’t freak out people, I promise you’ll love these. I pinky swear with caramel sauce on top! Jordan is attending four birthday parties this month. FOUR. Everyone is turning 10 so all of them are tweens that love glitter, bling, and Justice For Girls. I will admit that I only shop there with a coupon or when there is a clearance sale, unless I need birthday gifts. Which brings me back to today and my very tired credit card. Luckily I can use some of my grocery budget to pay for the clothing bill. I haven’t had to buy zucchini in weeks and I’ve got about 10 pounds of it still in my refrigerator. California is all confused, it’s only June and my zucchini plant is pretty much finished producing. At least I’m ahead of the game. I’ll have tons of recipes for you just in time for when your plant starts producing! Now, if you’re still reading, I applaud you. I mean, you read the title of this post and stuck with it, even with the weirdness: Zucchini Pie Bars. Did you know that when you cook zucchini in butter, cinnamon, and sugar, they taste like apples? It’s totally true, which is something I discovered two years ago. It’s like magic. And it uses up the zucchini that’s crowding your vegetable drawer. Also? It makes these pie bars a vegetable. They are a totally acceptable side dish, IMO. Let’s break down the bars, okay? Layer 1: a thick shortbread crust. I based this recipe off my Pear Crumble Bars from last year. Those were also one of my favorite recipes. The crust is a crumbly mixture of butter, flour, and sugar that gets pressed into a 9×9″ pan. It makes a nice thick crust, like you see here. Layer 2: cooked zucchini that tastes like apples. Again, I pinky swear. Peel the zucchini with a vegetable peeler then dice it small. You can also take out the seeds if you want by cutting it in half longwise and scraping them out with a spoon. I partially cook the zucchini in butter, cinnamon, and sugar just until the edges are translucent. This assures that the final product is cooked through and not crunchy. Layer 3: A crumble topping. There is nothing better than a crumble topping. THE END. When you cook zucchini with cinnamon and sugar it tastes like apples, I promise! 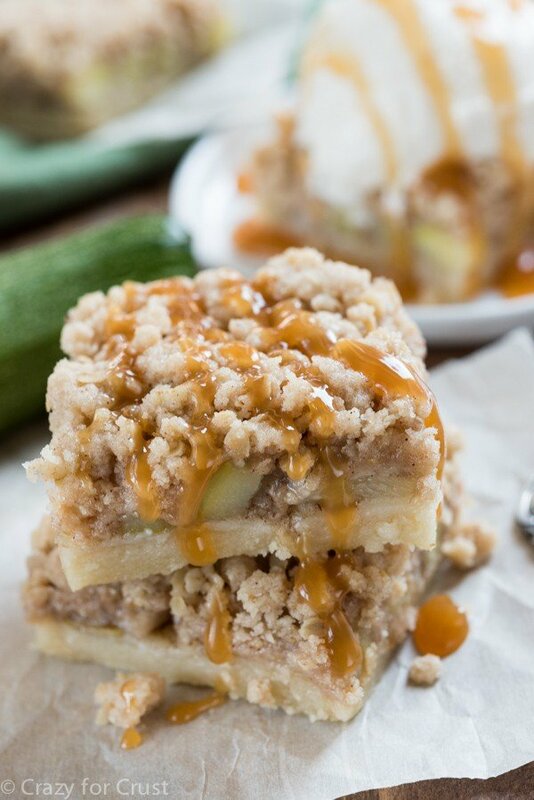 Make a crumble bar out of your excess zucchini and you'll think you're eating apple pie bars! Line a 9x9” pan with foil and spray with cooking spray (for easy removal and cutting of bars). Preheat oven to 350°F. Prepare the crust by slowly mixing all the ingredients in a stand mixer fitted with the paddle attachment or in a large bowl using hand mixer. The mixture will be crumbly and if you are using a hand mixer you may need to use your hands to break up any large chunks of butter. Press the crust in the prepared pan and bake for 15 minutes. Make the filling: Heat a frying pan over low heat. Melt the butter, then add the zucchini, sugar, and cinnamon. Cook, stirring often, for 4-5 minutes until the zucchini just looks like it’s getting translucent around the edges. Drain and let sit until the crust is done. Make the topping while the zucchini is cooking: you can use the same bowl you used for the crust. Use a stand or a hand mixer to cream the butter and sugar. Add the flour, oats, and salt and mix slowly. The mixture will be somewhat crumbly. Right before the crust comes out of the oven, drain the zucchini again. Remove the hot crust from the oven. Sprinkle the zucchini carefully on top (make sure they are well drained first - do not add any of the extra liquid! ), then sprinkle with the topping. Bake for an additional 25-30 minutes, until the top starts to get golden brown. Cool completely in pan before slicing into bars and serving. 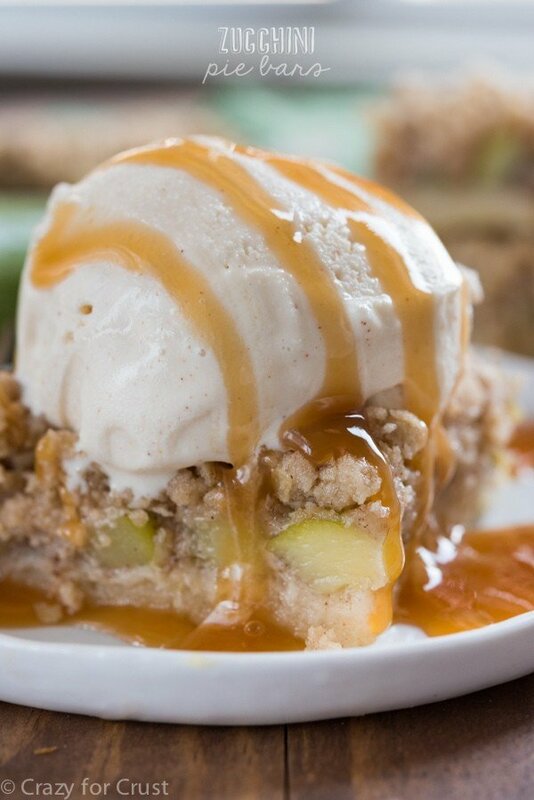 Serve with caramel sauce and/or ice cream or whipped cream. Store bars in the refrigerator in an airtight container for up to 3 days, or freeze them for up to one month. 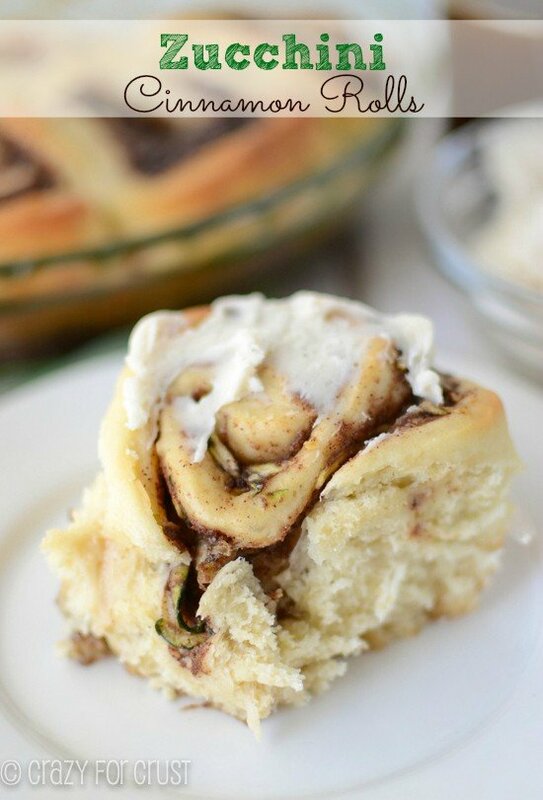 These are in the oven and smell very yummy. However, next time I would double the zucchini mixture. Didn’t hardly have enough to cover the whole crust. It’s such a nice thick crust, and plenty of crumb topping, but not nearly enough “filling”. Can’t wait to try them though! See, my motto is “I like thick crusts and I cannot lie”…but someone who likes filling more can definitely double the filling! 🙂 Enjoy! They were just as yummy as I had expected! What a shocker for squash! Right? It blows the mind that it works!! I made this yesterday for our zucchini themed work bakeoff today. Was hoping to make the zucchini cinnamon scrolls, but ran out of time, so made this one with a caramel sauce instead. It was a super close competition, but he ended up winning with a zucchini mudcake with zucchini icecream. Still please with how it turned out — way better than I expected to be honest! — and I doubled the filling. Had so many positive comments. 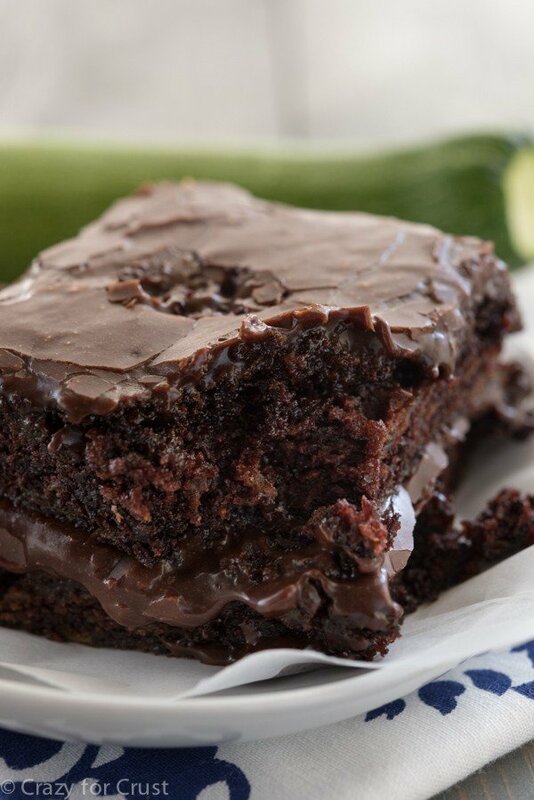 Brilliant way to use up extra zucchini….I just want to try all the other recipes now!! This looks delicious. Thank you for sharing! 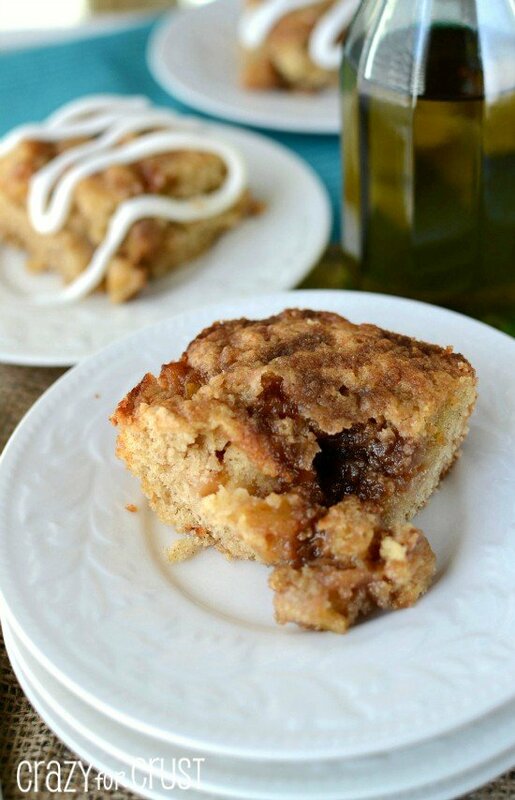 These zucchini pie bars look so amazing. 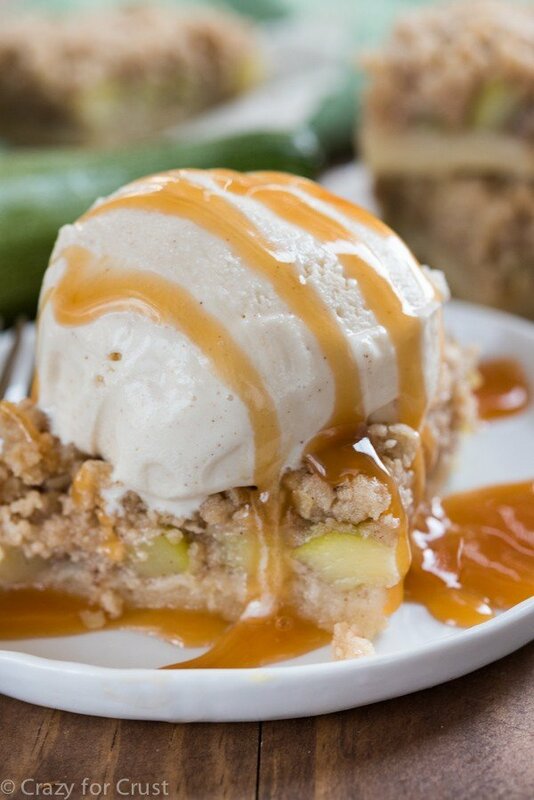 I have never thought of using zucchini as a dessert, this must a for me and my family to try. I have just made zucchini fries as a healthy snack. Love this recipe. Making it right away. I live different ways to use my zukes and get tired of the same old recipes. Thank you! I made the zucchini pie bars last night. It is so good. I used three cups of zucchini but next time, I plan on using more. Thanks for sharing the recipe! It’s a keeper!